Here’s a true truth for you, friends: I’ve never put a political sign in my yard. Not once in the 26 years I’ve been eligible to vote. Not a yard sign. Not a bumper sticker on my car. Not a pin on my person. It wasn’t like I had a problem with people who did. They’re passionate, I thought. Outspoken. And good for them! Then came 2016 and the election of Donald Trump to the White House. Then came shock. How is it possible that a human utterly devoid of moral character was ELECTED? By REAL, LIVE PEOPLE? On PURPOSE? And then hopelessness and wallowing. Not gonna lie, friends — that wallowing lasted a while. It was very Dark Night of the Soul around my house. Our country fell apart. Our church fell apart. Folks just everywhere hunkered down in their ideological bunkers and proceeded to boot out the reprobates like me and mine. It was Boot Fest 2017. Excommunicate the Riffraff. Cut Out the Cancer where we = the cancer. Thus for the first time, my family experienced a minuscule slice of what marginalized populations have experienced all along. No room for our ilk in the inn. It was, in other words, a major bummer. I don’t know when the awakening happened for me. Dawn arrives so slowly, doesn’t it? It’s Night, and then eventually it’s Not, but no one can pinpoint exactly when the change occurrs. I think I was still drowsy from the Dark Night — still a little drunk on despair — when it belated occurred to me that I might have contributed in some small way to Trump’s election. That I might need to conduct a tiny amount of self-examination. I might need to make a searching and fearless moral inventory of myself like addicts everywhere. I might need to admit my wrongs to myself, to God, and to other humans. I might need to make amends. Except not to the people I’d tried — and failed — to please. Not to the people in power. No; I might need to make amends to those who’ve been ostracized, wounded, excluded, and abused. Because I benefited from the power structure that disenfranchised them, and I did nothing to tear it down. I might need to admit my wrongs. I might need to make amends. Or I definitely do. I’m going to go with the latter. Admitting wrongdoing and making amends is harder than sticking my head in the sand, but it’s the only way to heal the world. And if we’re not here on this planet for that purpose, then why bother? Things are Not Right in America right now. Turns out, things have been Not Right for huge swaths of Americans for centuries, but some of us **ahem*me*ahem** were too blind to see it. Some of us — I kid you not — thought we were in a post-racist Age of Enlightenment in the States. Oh, we knew things weren’t perfect, but we certainly thought the general trajectory was upward for everyone. For people of color. For gender and sexual minorities. For women. For asylum seekers. For All the People, you know? All of them. Bless my darling little heart, I could not have been more wrong. People were suffering (see links, paragraph above) — people were dying — but I wasn’t, so I easily believed other folks were fine or getting there. Turns out, I was using my privilege to remain silent because I could afford it. My world changes very little based on who’s in power — that’s what it is to be privileged, after all — so I kept quiet even as people continued to be systematically disenfranchised. Power and comfort are the drugs. I’m the addict. Inertia was easier than action, and more comfortable than being criticized as a trouble maker and a rabble rouser. But I don’t want to be someone who is a bystander while people suffer. I don’t want to set that example for my children. I want to be someone who loves my neighbor as myself. I want to be someone who helps light the path to safety and succor. I want to be someone who knows to my bones — and who acts on that knowledge — that all people are my neighbors. That their humanity makes them so, and I need know nothing more about them to offer what I have and to reach out with help. I’ve spent some months thinking. And I’ve spent some months flailing. I’ve spent some time figuring out the next small step forward, and then the next, and then the next. Because self-awareness is great — fantastic, WONDERFUL — but amends mean nothing without action. So here we are in the election cycle, and it’s another next step. A small opportunity to Put Up or Shut Up, and everyone knows Shut Up’s not my thing. My friend and I organized a BBQ for our neighborhood. We invited everyone, especially people we didn’t know. We fed them hot dogs and watermelon in the street while kids ran in and out of the house playing hide-and-go-seek and spilling sugar-free, fake juice product on their shoes. And we invited the local candidates we support in our little town of Newberg, Oregon. 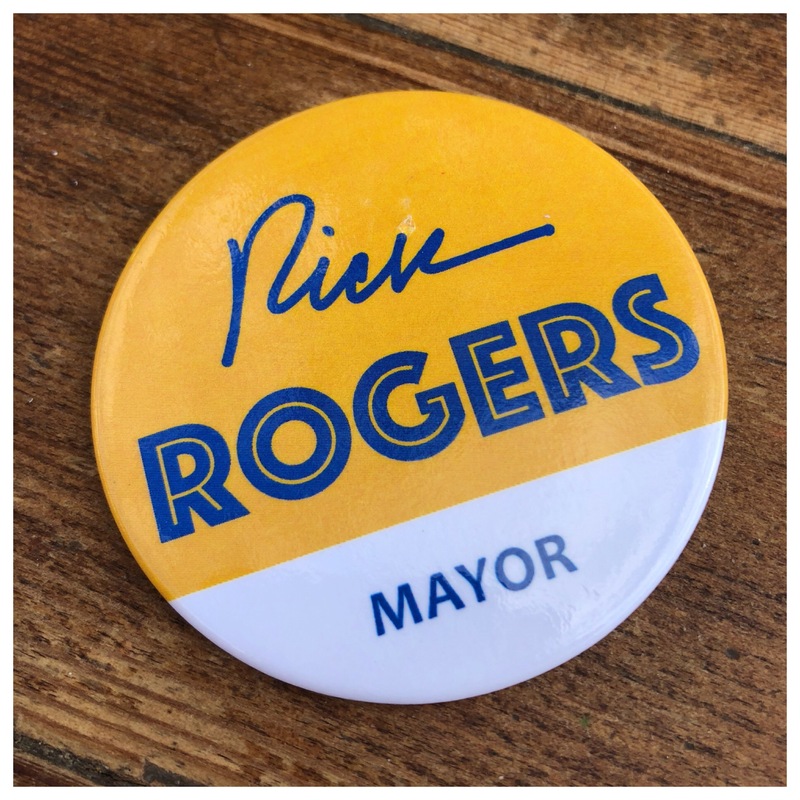 Rick Rogers for Mayor. Casey Kulla for Yamhill County Commissioner. Sarah Grider for Oregon State Senate. Jennifer Chapman for Yamhill County Circuit Court Judge. Elizabeth Gemeroy, Patrick Johnson, and Stephanie Findlay for City Council. What do you mean you’re reading this in California or Texas or Illinois, and you’ve never heard of Newberg, Oregon or Yamhill County? THIS IS THE MOST IMPORTANT ELECTION THIS SEASON. And so is YOUR local election. Because a population involved at the local, grassroots level is a population with a voice. A population sharing a few minutes to stand together in the warm September sun over crappy hot dogs is a population that will move mountains and bring mighty winds of change. A population that knows its neighbors — ALL of them, including the ones those of us with power and privilege formerly failed to SEE — is a population that understands that all children are our children. There is no ME or MINE. It’s only ever been WE and US, even if some of us were pretty slow on the uptake. It’s trickle up economics, folks. When we bolster the needs of those around us — when we amplify aching voices instead of failing to pass their message along — we bolster all of us. Every single one. To be clear, and selfish really, I WIN when our community is healthy. MY FAMILY wins. It’s just SO DOES EVERYONE ELSE. The sum becomes more than its parts. We’re all healthier, happier, safer, kinder, more magnanimous and aware when we’re plugged in and pulling for the whole instead of protecting our piece and hunkering down. And… psst… healthy communities are able to speak truth to power… truth to bigger platforms… truth to huge campaigns… with more unity, more energy, more conviction, and more clarity. Small battles win big wars, friends. Every journey begins with one step. Insert any overused-but-true cliche you like, just understand that starting with your community — starting where you can — matters. Caring for our neighbors — our literal, next door neighbors — and wading into the mayhem and majesty of human relationships and the human condition teaches us tangibly to love others as ourselves. And when we begin to love others, we realize everyone is our neighbor. It’s a vicious cycle minus the vicious. An abundant cycle. A lavish cycle. A generous cycle. So this voting season, we’re educating ourselves on who’s running, who benefits from their leadership, what their platforms are, and how we can help put people in office who will help us work together to lift up our community. Our WHOLE community. Our yard is filling up with signs. I have bumper magnets on my car. I’ll be wearing my pins to the grocery store with pride. P.S. In other new news, those of you who’ve been around here before will notice there are NO MORE ANNOYING ADS popping up. That’s because I could not stand them. (Could. NOT.) Instead, I’m selling right side bar ads to companies I like and approve. No pop-ups + visibility for brands I like + a way to pay for this site = WINNING. If you or someone you know would like to advertise with me, shoot me an email at Beth@BethWoolsey.com. Put “I Want to Advertise With You” in the subject line, if you’d be so kind. As always, speaking truth to power. Thank you, Beth – your words and your heart resonate. Living one state north of you (and in a city with a mix of conservative and progressive voters– a city which is surrounded by a region that is very conservative and proud of it, where the region is beautiful and the politics are harmful) and slowly getting to the point you are at now. I gave money this year (twice!!) to a local candidate’s fund for the first time in my 34 years of voting. I’m not there yet with the yard signs, but it is on the horizon. Thank you for your encouragement! I love this. I too have been struggling, particularly with the realization that I’ve been living the *many* benefits of being a part of the privileged class which doesn’t suffer the institutionalized discrimination that is constantly a barrier to marginalized populations. A great book, for more on that, is White Fragility. Difficult at times to accept, but an extremely important read for all. I love this article, I love your belief in the possibility of change. We do so desperately need to turn this ship around. Thursday, Grace Nelson visited my job. She is Bill Nelson’s wife. Prior to that visit, I didn’t know who he was. That’s because I bury my head in the sand where politics are concerned. Where bad news is concerned. Where anything negative is concerned because it makes me sad, nervous, depressed, uncomfortable – and because I can’t do anything about it. But Thursday, Grace Nelson visited my job. She spoke on taking care of people. She spoke on quantum physics – which broken down into really simple terms means that when something happens in one community, it tends to pop up again in another, seemingly unrelated community. It’s called an echo. And love is the strongest force in an echo. She spoke about how our world desperately needs echos of love. She spoke about how WE can each make a difference by being kind. I know I’m not getting the magnitude of what she spoke about. But suffice it to say, I will be voting in the coming election, because her husband, Bill Nelson, is defending his seat on the Senate – he is Florida’s senator. And with a wife like Grace Nelson speaking into his life on a regular basis, I can’t imagine how he could avoid creating echos of love in our capitol. And our capitol needs it!